Extremist militants aim to restrict missionary activity, sources say. YANGON, Burma (Morning Star News) – Ethnic Wa rebels this month shut down churches or destroyed their buildings and temporarily detained several clergymen in eastern Burma (Myanmar), sources said. On the border with China, soldiers of Myanmar’s largest ethnic rebel group, the United Wa State Army (UWSA), attacked the churches in the rebel’s autonomous region in Shan state, according to Christian leaders. “We confirmed that at least 12 churches have been destroyed or closed as of Sept. 20,” a Christian leader who has lived in the Wa region for several decades told Morning Star News. The Wa people worship ancestral spirits, and the move by the UWSA was meant to hamper Christian missionary activity, said the leader on condition of anonymity. Most of the targets were Baptist churches in Panghsang, where Wa soldiers destroyed crosses, the source said. The headquarters of the UWSA is located in Panhsang, on Burma’s border with China. 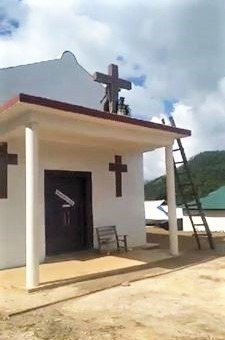 A video showing the UWSA soldiers damaging a church building in Mong Maw town on Sept. 19 was widely circulated by Myanmar Facebook users. 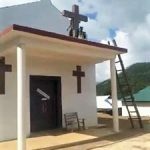 Local sources said schools built by Christian organizations in Panghsand town also have been shut down. Local media reported that the UWSA rebels attacked because the church buildings were built without UWSA permission. The rebel soldiers in the past week detained and questioned several Christian leaders in the UWSA controlled region, sources said. U Nyi Rang, a spokesperson for the UWSA, told the Myanmar Times, a Yangon-based newspaper, described the rebels as controlled by extremist elements and said UWSA officials are looking into whether the arrested religious leaders are allowed to carry out their activities in rebel-controlled territory. Although most of the population in Wa territory worships spirits or Nats, there are also Buddhists as well as Christian communities such as Baptists and Roman Catholics. Many area members of ethnic minority groups, such as the Ahkar, Lahu and Kachin, as well as the Wa, are Christians, sources said. Missionary activity among the Wa has long been carried out, but attacks have been growing steadily worse, and some suspect Chinese authorities are behind them, a local Christian leader who is a long-time resident in the Wa region told Morning Star News. Bertil Lintner, a veteran journalist who has written several books on Myanmar ethnic minorities, wrote in Asian Times Online that pressure from Chinese authorities on the border is believed to be behind the restriction on Christian activities in Wa areas. The Chinese Communist Party see missionaries as tools of Western influence among Myanmar’s ethnic minorities, including the ethnic Wa who have Christians among them, Lintner writes. The statement promises to punish local administration officials who support missionary activities, prevents the construction of church buildings and requires that leaders of existing churches be native and not foreign, Asia Times Online reported.